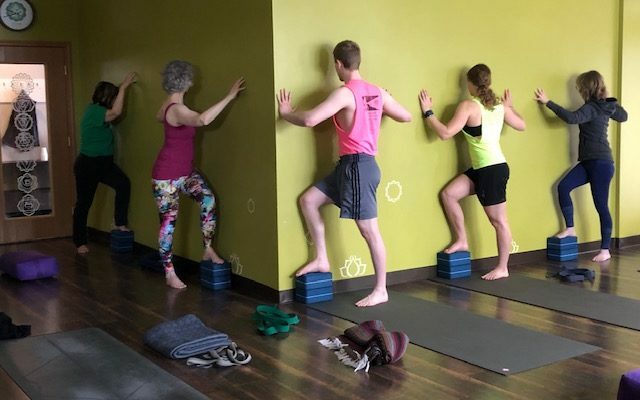 Namaste Yoga cultivates a community of love, light & wellness, offering excellent and compassionate yoga instruction for all ages and levels of student. Namaste Yoga invites you to come home to YOU through practice in a peaceful, non-competitive environment, to de-stress, increase your strength and flexibility, and be the healthiest you can be. Your first class is FREE at our studio and you receive 25% off of your first class pass, good for all of our over 45+ classes at Namaste. We offer a warm, welcoming environment from the moment you step in our doors. Join us for a wonderful beginning to your practice, or to continue blossoming your current practice. Namaste! Chris Van Huysse offers RESTorative Yoga the first and third Fridays, 6-7:15PM each month beginning in February. Check the class tab for dates. Beginner’s Workshop with Michele & Mary is the first Saturday of each month from 1-2:30 in the afternoon. Need prenatal yoga? We offer private sessions with Charlene Tyrrell, 200RYT and retired doula. Contact the studio phone or email at namaste2@windstream.net for more information. Join Eden Koz for a donation meditation workshop on Thursday, April 18th, from noon to 1:30PM. Suggested donation, $25 to benefit Akron Yoga Summit programs. Join Chris for Love. Mom. Yoga. honoring all moms, Saturday, May 11th, 2:30-4PM, $25 fee. Learn more and register for Classes or Workshops. Just a reminder, students should do their best to arrive 5 minutes prior to the start of class to avoid disrupting the experience of other students. Props and mats are here for your use! Namaste offers a peaceful environment in which to practice, we do our best to keep to our listed times, and we appreciate that you choose to share your time with us. Remember, your first class is FREE and NEW students receive 25% off their first class pass. See details on our Classes tab.